Unit frame of rustproof fiberglass structural channel. Operation controlled by low feed water pressure switch and solid state time delay relay. Ten Standard Models: 100, 150, 300, 1000, 2700, 4000, 5400, 8000, 12000, & 16000 LPM. RO systems remove salts, micro-organisms and high molecular weight organics. The System capacity depends on three major factors. 1. The feed water temperature. 2. Total dissolved solids in feed water (TDS). 3. Operating pressure and the over all recovery of the system. Buy BLAIRS RO System & Save Money! Why go for plastic jars and colorful labels that squeeze your water everyday. Economical to use. at less than 50 paisa a liter. Save valuable cooking time and costs. BLAIRS RO is the most efficient and effective method of water purification known to man. It removes impurities as small as 0.0001 micron size (a human hair is 50-70 microns thick!) cleansing water of all biological impurities, suspended particles, dissolved solids (TDS), salts, fluorides, metals and chemicals. Most non-RO systems can filter particles only up to 5-10 microns in size, leaving behind almost all dissolved impurities (like bad-tasting salts) and some fine physical impurities. RO is membrane separation process in which feed water flows along the membrane surface under pressure. Purified water permeates the membrane and is collected, while the concentrated water containing dissolved and un dissolved impurities that do not flow through the membrane is discharged to the drain. RO is a modern process technology to purify water for a wide range of applications including semiconductors, fisheries, food processing, biotechnology, pharmaceuticals, power generation, seawater desalting, and municipal drinking water. 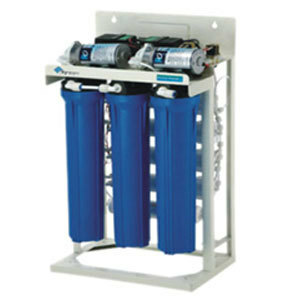 RO is the cost effective water purification system it is an immediate source of pure water. The process of RO represents the finest level of liquid filtration available today. And though the term sounds mysterious RO isn't really that complicated. Ordinary water filters use a screen to separate particles from water streams. The holes that these filters have are fairly large. This allows just about everything that is dissolved in the water to pass through as well. An RO system employs a semi-permeable membrane. The membrane is a thin multi-layered sheet with pores so small that water molecules can pass through, but it acts as a barrier to dissolved solids like salts and other chemicals. Thus even bacteria and viruses are trapped and not allowed to pass through. a) 95% - 99% of the TDS. b) 99% of the organics and bacteria. Stage 1: Sediment filter removes physical and suspended impurities such as sand, dust and rust etc. There are several advantages of reverse osmosis based water purification technology. The membrane used in this water filtration process is useful for effective removal of parasite like cryptosporidium that causes diarrhea. Apart from eliminating harmful content like arsenic and mercury, this technology is useful for treating hardness of water. By eradicating chlorine content and odor of water, reverse osmosis helps to improve taste of drinking water. Being energy efficient, RO system has low operating cost. It acts as the cost effective and reliable solution of providing purified drinking water. Simple to install, its maintenance charge is quite affordable.